I checked the current weather on the Web to make sure that the very high humidity was not a product of my imagination. Some clothes from this morning’s laundry have been hanged but at this rate they are not even close to be dry until tomorrow. Environment Canada confirms: the air is over 90 % saturated with humidity and humidex is 29. What really is humidex? I knew that it was supposed to represent the perceived temperature, but I clicked on the link for more information. It finally reveals that the formula does not have a strong physical basis. This empirical formula essentially is H = T + (e − 10), where, T is the temperature in degrees Celsius and e is the vapor pressure in mbar calculated from the dew point. 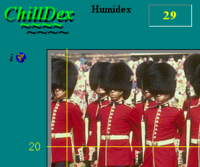 The site also offers a program named Chilldex to calculate the humidex and relative humidity based on the temperature and the dew point, but only if you run Windows… Ha! Let’s use our mad Python skillz and create our own tools! Don’t hesitate to modify and share.